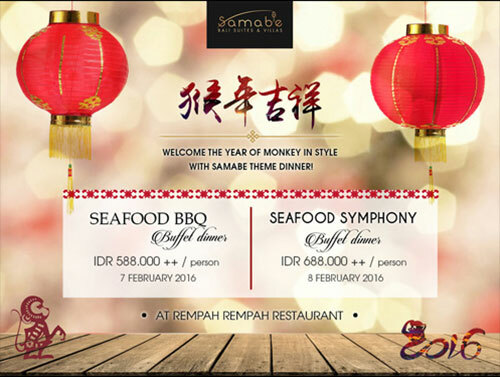 To celebrate Chinese New Year of Monkey falling on 8 February 2016, Bali, Samabe Bali Suites & Villas has prepared luscious dishes on its dining tables in Rempah-Rempah Restaurant. Prior to the grand dinner, an elegant cocktail party will kick off the festivity. The seasoned Executive Chef, Tashia Yunasz, has designed her first rate dishes in two menus for the Goat year farewell- Seafood & BBQ for the new year's eve feast and Seafood Symphony for the dinner on 8th February 2016. Intending to give notable gastronomy experience, she combines the tasteful Asian food including toothsome Indonesian bites, and western cooking, such as bird nest soup, Norwegian Salmon en Croute, and Pisang Goreng.